I’m not a natural planner (helllloooo, INFP), but I’ve learned (the hard way, always the hard way) that things go so much better when I take the time to wrangle things into some semblance of order around here—my stuff, my calendar, my brain. On a typical Monday morning, my journal functions as a glorified to-do list. It’s not glamorous. But in the longer-term, I use it to capture or file a good 85% of the swirling thoughts that would otherwise distract me from the task at hand. David Allen of Getting Things Done fame has one core tenet that underlies his whole system, and it is this: capture your stuff. This is how I do it. This is a tool I’ve come to love in the past year: it’s a slick notebook, with a faint graph print and square pages, that I use to capture notes, thoughts, and ideas. (The square pages are especially good for mind maps; that photo above is a mind map of this bullet journal post.) There’s something about the smooth shiny pages that makes my pen go a little faster, which makes it perfect for brainstorming. I use this to take notes from meetings, conferences, and phone calls, and to brainstorm book lists and travel plans, and when I put on my literary matchmaker hat for the podcast. It never has to be pretty, and most pages get tossed after I’ve used them, but it’s an invaluable part of my process—it helps me capture and plan and think. When I’m done with my scribbling, I put the post important ideas in my bullet journal. It’s not unusual for me to condense 250 hastily taken notes into two key takeaways. Right now, these are the three tools I couldn’t live without. I’m continuing to learn more about organization—lately two highly organized friends have taught me a few tricks that I’m starting to incorporate into my routine, and I’ll tell you about those when I get the hang of them a little better. I would LOVE to hear about your favorite organizing resources and your best tips and tricks in comments! 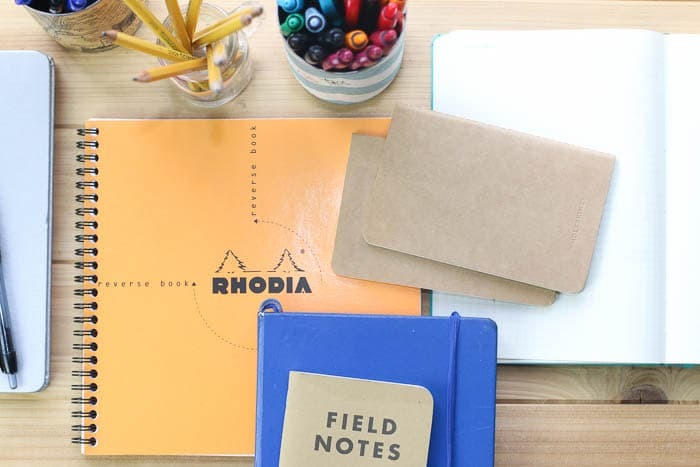 Ah, I love the Rhodia Notebook idea. I have finally figured out a Bullet Journal system that seems to work for me, although that is ever-evolving. That is the beauty of the BuJo! I find myself needing a true “note” book though – a place I can hash out ideas and literally take notes that won’t clutter my bullet journal. I think this Rhodia pad fits the bill. I love the idea of transferring only the important info. to your bullet journal. I love mind mapping and making vision boards. You’re right, they are kept in a way a quick list isn’t. I appreciate those brainstorms and do go back and look at them. My challenge is keeping my various notebooks with me when an idea strikes AND not having too many organizational tools. I just tapped my eleven year old into his own Google calendar and shared our family one with him. It’s been a great way to help him organize his days and the things he wants to do. Gives perspective when I say we need to postpone something for a week or month. As a fellow “Anne-with-an-e-INFP”, could you share how you built the habit to use these tools? I find that whenever I start a new system, I forget about it as I wake up the next morning and fall into the craziness. I know you’ve written before about how you track habit building, but what about working on the habit in the first place? Yes! I second this question! This was an absolute dream to read. Love the dual calendar (Google is already great to coordinate between people, but the paper calendar for the kids is revolutionary) – people seem to think its one or the other these days! Personally, find Trello a really useful online tool to organise group projects. We have calendar overload at ours! One in my BuJo for me, a whiteboard in the kitchen with weekly meals and major events, and a paper calendar on the wall that duplicates everything else for the family to see what’s coming up. I use google too for reccuring events and inputting while on thebut don’t always manage to keep them in sync! I know everyone’s all about the Leuchtterms, but my favourite is a Moleskine soft cover XL – big enough that it lasts for months and I don’t feel I’m rushing through the pages. Small squares to give small writing lines or a bit of structure for grids. For some reason my writing is _much_ neater when it has to be small! I like that the soft cover folds back easily to write on both sides, I’ve not found this works as well with hardcover books. I do slip much more into diary/processing mode than you do though, all mixed up with the ‘reply to x’, ‘girls wrote a history report’ and ‘science workshop on the 19th’ practical stuff! I find it works having it all together until the kids start looking over my shoulder! Thanks for the post – off to check out some new pens (even though in reality I only ever use the Pilot V5RT that’s stuck on the side!). I also purchased the bundle and besides the bonus offers, I hope I get some good things out of the books and actually spend time reading them! Haha! Anyway, I might be wrong but I was trying to find a post I thought you did within the last week or so saying which classes you had already taken and paid for that you enjoyed. Was that post taken down? I would love to see that info even if it was last year’s bundle because I have that too!! Thanks for your awesome blog! I get lots of helpful and practical tips! I really appreciate all the effort you surely put in to making it so great!!! I use Wunderlist to keep organized- I have to do lists shared with the hubby & it will remind him so its not ME reminding him to paint the shed! I use it for work and for planning trips, packing, everything. I am obsessed. I can attach files to it, share with multiple people, and it is available on every platform. The other thing I use is Google calendar- for everything. WE make new GMAILS for big events (like planning our wedding) and then we had a Wedding calendar that merged with our personal and work calendars. The last thing, I second Trello board for project planning, especially with a group. Though Wunderlist can work fine for it if you want to limit tools. Wunderlist is also FREE FREE FREE. 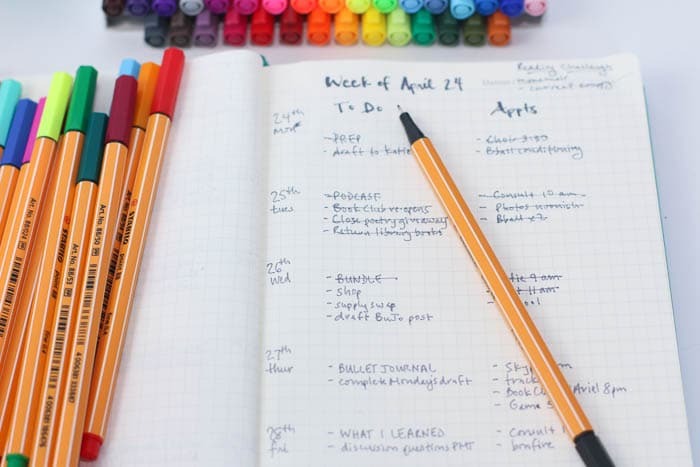 Maybe you answer this is some of your posts on bullet journaling, but do you think a bullet journal could be used as an all-in-one planner? As in, meal planning, school planning (we homeschool), to-dos, new ideas, etc…? It seems like that might be just what it is designed for, but what is your opinion? Bethany, I use my bullet journal for all of those things and it has worked wonderfully! When I make my Month spread, the right hand side of the page is divided in half. The top half is my To Do list, and the bottom is my School To Do for the month. I typically make a little weekly school to-do list as well. Then I work from those and use spiral notebooks for my kids’ daily assignments. Look on Pinterest for how to use bullet journal for homeschooling and then just try a few things! I love the bullet journal because it’s so forgiving, if one system doesn’t work for you, just turn the page and try a new one. I will say one word of advice, that I’ve found running lists always work better for me than elaborate fancy charts or pictures. I think Anne has mentioned that too. The simpler the better. As for Meal planning, when I’m starting a new spread, I fold a center sheet in half. I list the week’s dinners there and then the back half becomes my running grocery list that I can tear off when it’s time to shop. Hope this is helpful! For the kids I use a pretty stick-on-whiteboard calendar that stays on the fridge. I add dates monthly and appointments on a monthly basis. They don’t need to ask me when is that field trip or when am I going to grandma’s because it’s all on that calendar on the fridge. Your organizing tips are the best! I just watched your ‘7 Ways to Get More Out of Your Reading Life’ class and was dying to have you explain the papers taped to the wall in the background. This is exactly how my brain works. Every post you do on being a visual learner and having to think on paper and see a visual in front of you has helped me immensely. Thank you for all your wisdom and advice. I can’t wait to hear the other tricks you have learned from your friends. I’ve also loved your posts about the best organizing books you’ve never heard of. They have changed my life. I would love to see a class on this in the future ;). Thank you for improving my life so much!